Review: "Sonic Syndicate: Eden Fire" - Sea of Tranquility - The Web Destination for Progressive Music! 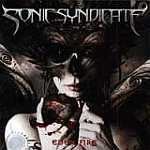 It's no surprise that Sonic Syndicate are from, you guessed it, Sweden. That's because one listen of their debut release Eden Fire is so full of characteristic Swedish melodic death metal elements like intricate guitar harmonies, crushing riffs, sledgehammer rhythms, aggressive death metal vocals, clean melodic vocals, and spacey keyboard textures. Much like their fellow countrymen Soilwork, Dark Tranquility, and In Flames, Sonic Syndicate have at times a very accessible sound. Songs like "History Repeats Itself" and "Zion Must Fall" contain wonderful harmonies and catchy melodic moments amidst all the raging metal mania. The use of keyboards is also very pronounced in this band, which will certainly please the progressive metal sector. Word has it that the average age of the band is somewhere in the 20-21 year old range, which makes it all the more remarkable the professional job done on this album. These guys can flat out play, and it shows on the CD's ten songs, which are broken up into three sections. The band reworked songs from their original EP's into the framework of this album so new fans can get to hear the older material as well, but it all comes across like one epic release. On the first part, the Helix Reign section, the band goes for a heavier stance, and the songs are a bit more direct. Mixing different styles of death and clean vocals, as well as some enchanting female vocals, these new tunes show a band right on the verge of hitting their stride. The Extinction material is especially strong, containing some moments, like on "Misanthropic Coil", that rival the mighty Meshuggah in the guitar riff department. I also enjoyed the unison guitar and keyboard lines on "Prelude to Extinction", which added a nice virtuoso feel to the piece. The Black Lotus section is very sweeping in its scope, almost approaching power metal at times thanks to the double bass drum work and mounds of keyboards. It's also worth mentioning the amazing booklet artwork by J.A. Aranguren, who did a fantastic job that really adds to the quality of this release. There's a new face on the Swedish melodic death scene folks, and if they keep this up expect to hear people mentioning Sonic Syndicate in the same breath as the classic bands we know and love. Recommended.